Sold individually. 1 tablet will last about a month! The Most Effective Drain Pan Treatment... Ever! Slow release gel tablet that is safe, non-toxic, and non-corrosive! Sludge in drain pans and lines can cause stale water odors, and worse; they can lead to clogged or plugged lines. Sludge clogs in the pan or line do not allow the plumbing hardware, to function properly. Condensate that backs up and overflows can cause troublesome and expensive damage to surrounding structures. Avoid these issues with regular maintenance, that incorporates our Pan Gel Tablets. These AC Drain Pan GEL tablets are a unique approach to A/C drain pan treatment. As the moisture either drips on or flows over the gel tablet, it forms a gel, locking the geltab into place. This locking action never allows the geltab to move or block the drain line. The AC Drain Pan GEL tablets’ uniquely designed formula with AT-8 turns the geltab into a very slow gel release, giving it a positive, long-lasting and aggressive cleaning action. 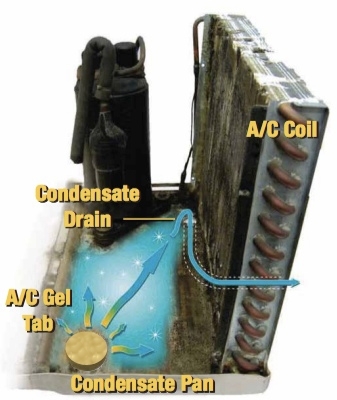 The geltab will clean sludge and other accumulations in condensate drain pans and lines, eliminating plugged condensate drain lines and stale water odors. Applications include: restaurants, hospitals, universities, shopping malls, municipalities, supermarkets, cold storage facilities and more. 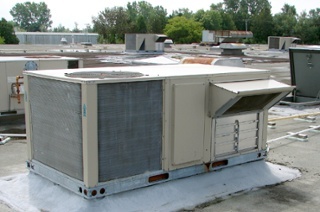 All HVAC units, other than cooling towers & evaporative condensers, necessitate this type of processing. Other Searches: Air condition mold control, air condition pan tablets, algae grown in AC drip pan, moisture from air conditioner.